"Being a man of many instrument choices. Beyond guitar, I consider lap style instruments my "first instrument". 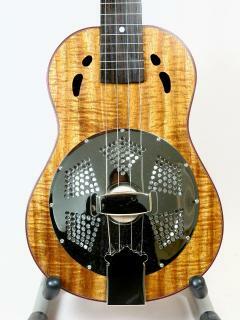 I'm an avid player of lap dobro, pedal steel, Weissenborn's, Oahu lap guitars... the list is long . 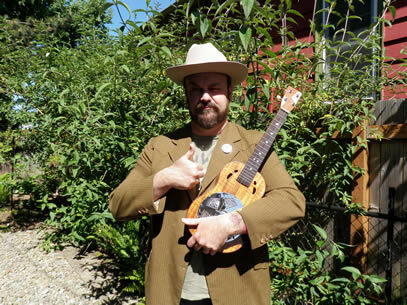 I was ecstatic when I found out Gordon and Char could build me an uke to my specifications, however I was "over the moon" when I searched their website and found that they made a square neck resonator "lap slide" uke. That said, I have to say was skeptical when a uke company was professing it could build a lap instrument. I thought to myself, "Self, are these people crazy? Why are these people building lap ukes?! And why don't they realize that is all they should be building? They could retire just on building 4 string lap ukes! Why are they wasting their time on those other ukes?" Seriously, for a company to make what is arguably a fairly obscure instrument of high quality by hand such as the lap uke is truly a testament to why Gordon and Char are in this business: it's their passion that they wish to share with the world, and believe me, each note that comes out of this lap uke is a hymn to their endeavors." Best known as the multi-instrumentalist in the indie rock band The Decemberists, Chris Funk has also found much success as a music producer, composer, and studio musician. The artist has lent his musical acumen to such bands as The Shins, Laura Veirs, Blue Giant and more. Funk is also a founding member of the acclaimed neo-gothic string band Black Prairie on Sugar Hill Records. He has produced records for Red Fang, Langhorne Slim, The Builders and The Butchers, and Y La Bamba. He recently opened a studio in the office’s of Search Party West, a music supervision company headed by the legendary music supervisor Randall Poster where he plans to continue producing as well as focusing on soundtrack work and supervision. The Decemberists’ new album, “The King Is Dead,” was released January 18th and was #1 on the Billboard “Top 200” for it’s first week. In 2006, Funk curated with Brendan Canty (Fugazi) the Portland edition of “Burn to Shine,” a DVD series where bands perform in a home that is later burned to the ground that same day. Funk recently appeared on Comedy Central’s The Colbert Report where he was challenged by host Steven Colbert to a ‘guitar shredding’ contest. After Funk's solo, Colbert hurt his hand and asked Peter Frampton to fill in. The contest ended with Colbert and Frampton deciding the winner and Colbert was awarded The Decemberists’ album, The Crane Wife, as the grand prize. Funk then performed an all-guitar jam alongside Frampton, Robert Schneider (of The Apples in Stereo), and Rick Nielsen.